Aguascalientes is the capital of the state of Aguascalientes and the largest municipality by population. 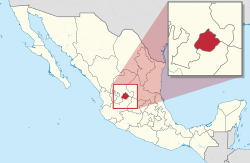 Aguascalientes is a state in North Central Mexico that is divided into eleven municipalities. According to the 2015 Mexican Intercensal Survey, Aguascalientes is the sixth least populous state with 1,312,544 inhabitants and the fourth smallest by land area spanning 5,630.27 square kilometres (2,173.86 sq mi). Municipalities in Aguascalientes are administratively autonomous of the state according to the 115th article of the 1917 Constitution of Mexico. Their legal framework derives from the state Constitution and the 2003 Municipal Law for the State of Aguascalientes. Every three years, citizens elect a municipal president (Spanish: presidente municipal) by a plurality voting system who heads a concurrently elected municipal council (ayuntamiento) responsible for providing all the public services for their constituents. The municipal council consists of a variable number of trustees and councillors (regidores y síndicos). Title 9 of the Municipal Law provides for the establishment of unipersonal auxiliary authorities (autoridades auxiliares) to represent local communities in the municipalities. Municipalities are responsible for public services (such as water and sewerage), street lighting, public safety, traffic, supervision of slaughterhouses and the maintenance of public parks, gardens and cemeteries. They may also assist the state and federal governments in education, emergency fire and medical services, environmental protection and maintenance of monuments and historical landmarks. Since 1984, they have had the power to collect property taxes and user fees, although more funds are obtained from the state and federal governments than from their own income. The largest municipality by population is the state capital Aguascalientes, with 877,190 residents or approximately 66.8% of the state population. The smallest municipality by population is San José de Gracia with 8,896 residents. The largest municipality by land area is also Aguascalientes which spans 1,181.24 km2 (456.08 sq mi), and the smallest is Cosío which spans 130.07 km2 (50.22 sq mi). The first municipality to incorporate was Asientos on January 1, 1797 and the newest municipality is San Francisco de los Romo which incorporated March 1, 1992. ^ a b c d e "Número de habitantes". INEGI (National Institute of Statistics and Geography). Archived from the original on July 2, 2017. Retrieved July 15, 2017. ^ a b c "Unidad de Microrregiones Cédulas de Información Municipal (SCIM)" (in Spanish). Secretaría de Desarrollo Social. Archived from the original on December 31, 2017. Retrieved November 18, 2017. ^ "Constitución Política de los Estados Unidos Mexicanos". Article 115, of 1917 (in Spanish). Archived from the original on September 26, 2017. Retrieved September 27, 2017. ^ "Constitución Política del Estado de Aguascalientes". Act of December 11, 2017 (PDF) (in Spanish). Retrieved January 28, 2018. ^ a b c "Ley Municipal para el Estado de Aguascalientes" (PDF) (in Spanish). State of Aguascalientes. January 25, 2016. Retrieved January 28, 2018. ^ OECD (November 12, 2004). New Forms of Governance for Economic Development. OECD Publishing. p. 121. ISBN 9264015329. Archived from the original on December 1, 2017. ^ Polo Martínez, Humberto (November 2012). Administración pública comunitaria y gobierno local en México: Las autoridades auxiliares municipales (PDF) (in Spanish). National Institute of Public Administration. p. 142. ISBN 978-607-9026-26-4. Retrieved January 28, 2018. ^ a b International Business Publications (2009). Mexico Company Laws and Regulations Handbook. p. 42. ISBN 1-4330-7030-8. Archived from the original on July 29, 2017. ^ a b Estado de Aguascalientes. División Territorial de 1810 a 1995 (PDF) (in Spanish). Mexico: INEGI. 1996. pp. 66–69. ISBN 970-13-1491-3. Archived (PDF) from the original on January 4, 2018. ^ "Localidades y su población por municipio según tamaño de localidad" (PDF) (in Spanish). INEGI. Archived from the original (PDF) on August 31, 2018. Retrieved July 15, 2017.